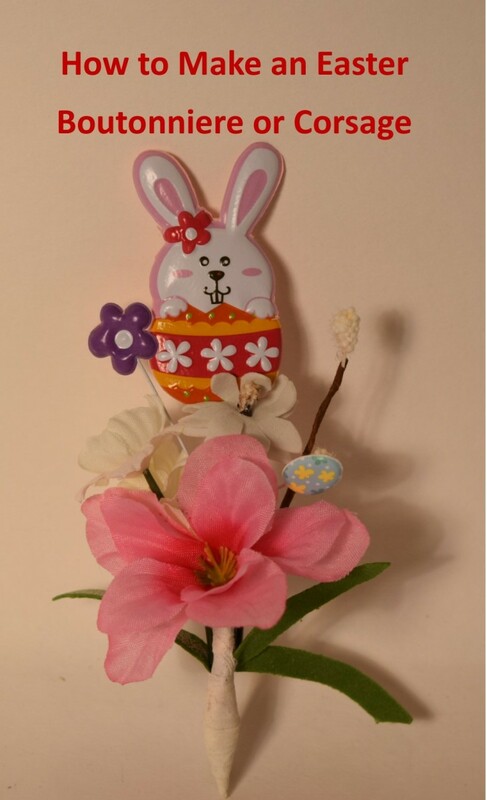 Let's Make a Cute Easter Bunny Boutonniere! 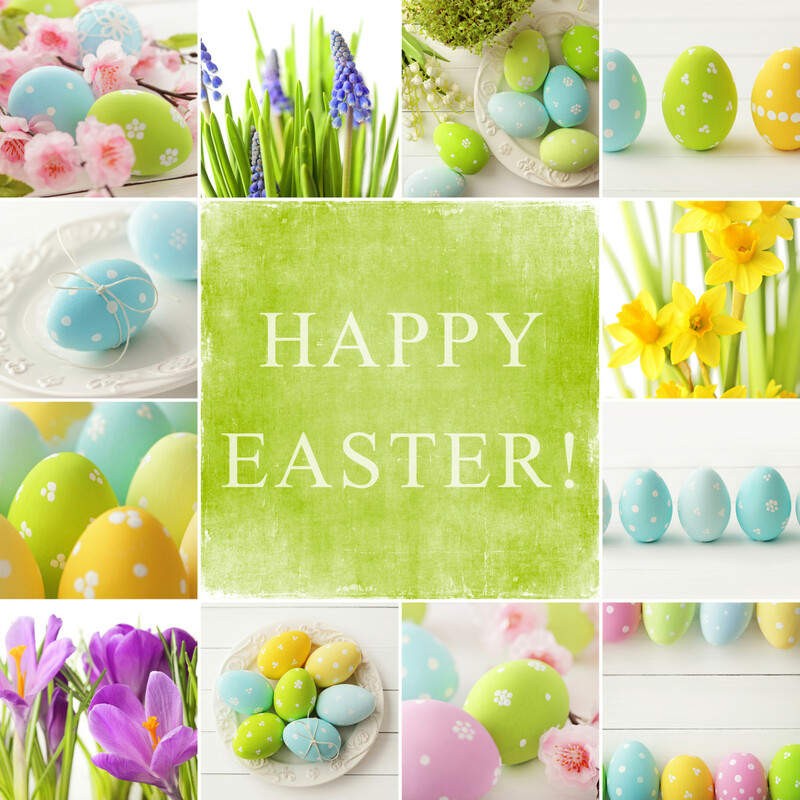 Easter has traditionally been a time when everyone gets new clothes and shoes for Easter Sunday. For those who couldn't afford new clothes, everything was carefully washed and pressed and the shoes shined. 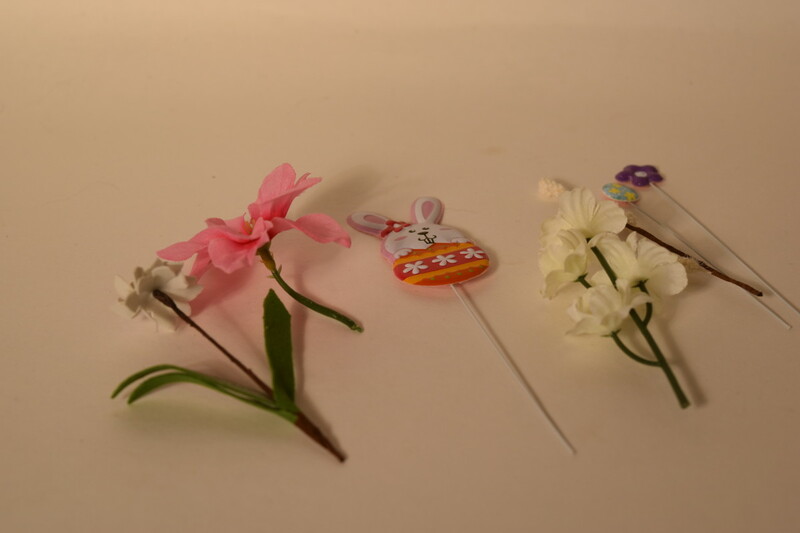 It is also a time for spring flowers and often a flower was stuck in a buttonhole or tucked under the ribbon of a hat. 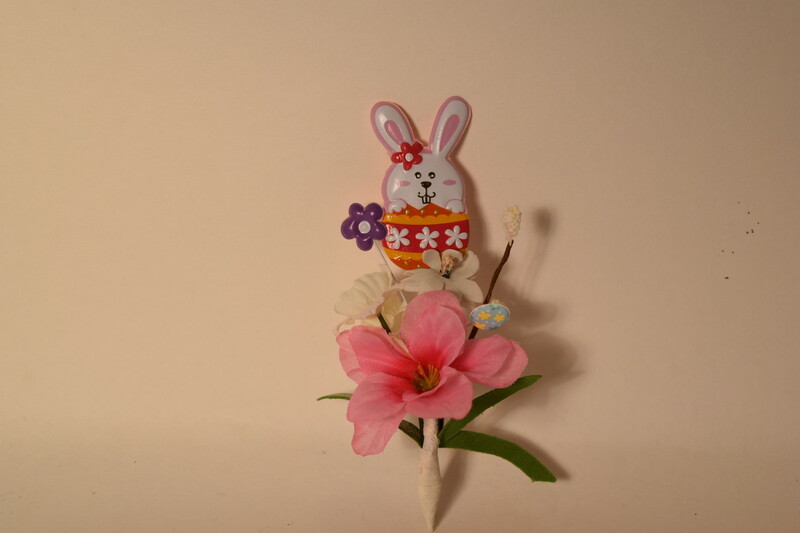 To that end we are going to make an Easter boutonniere or corsage so you can carry on the tradition of flowers for easter. We are going to use silk flowers here so that you can wear it without it wilting. What Is the Difference Between a Boutonniere and a Corsage? A corsage generally has larger flowers in it, where as a boutonniere has smaller flowers and is more delicate. It's a guy sort of thing. "No gussy and no fussy." 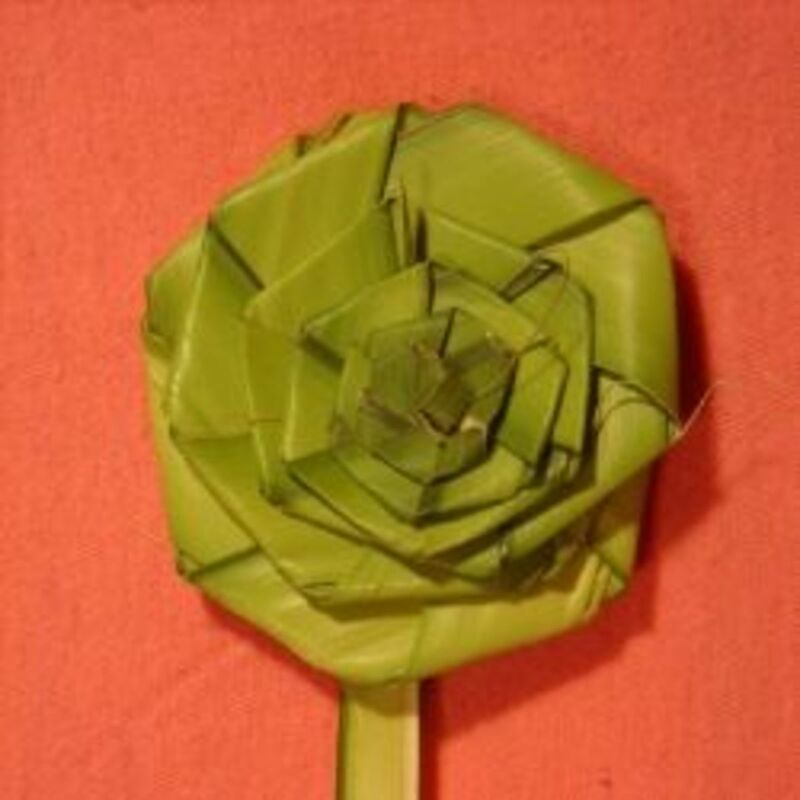 Corsages are generally worn by women and boutonnieres are worn by men. Boutonnieres are also the perfect size for children. Gather your supplies together so you have everything you need close at hand. 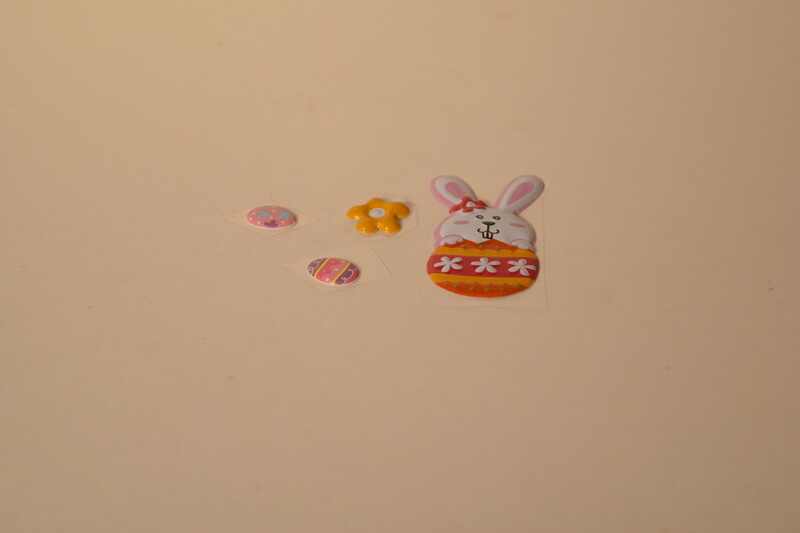 Decide which sticker is going to be your feature focal point and which smaller stickers are going to be fillers. You can look at the example at the top of the page for ideas. Take your focal sticker and cut around it, leaving a border of plastic. Lay it in one corner of your colored paper and roughly cut around the sticker. Peel the back off the sticker and stick the florist wire in the center of the sticker but as close to the top of the sticker without protruding. Take your colored piece of paper and stick it on the back of the sticker so that the entire back of the sticker is covered and the wire is still centered. Firmly rub the paper so that there are no gaps and run your finger nail down each side of the paper where the wire is to secure the wire and the paper. 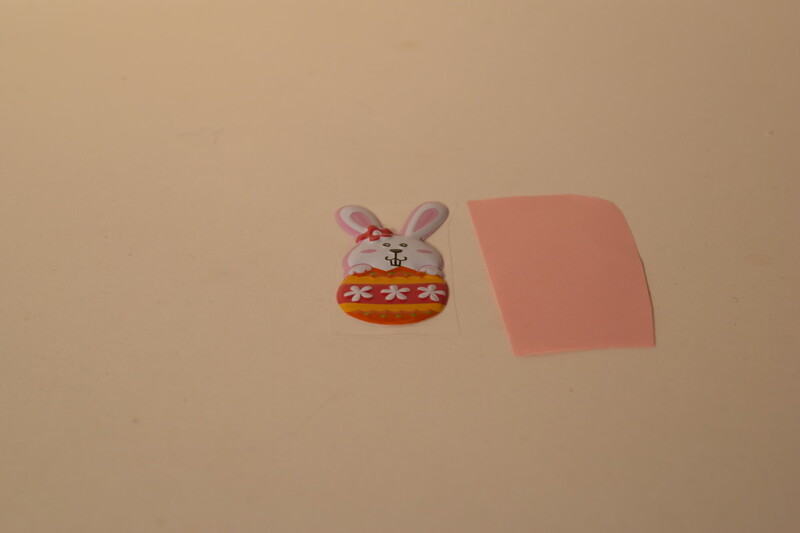 Now cut around the sticker as close to the edges as possible so that you have a sticker on a stick with a neat backing. Do not cut the wire yet. Do the same thing with the smaller stickers you have chosen. Do not cut the wire yet. 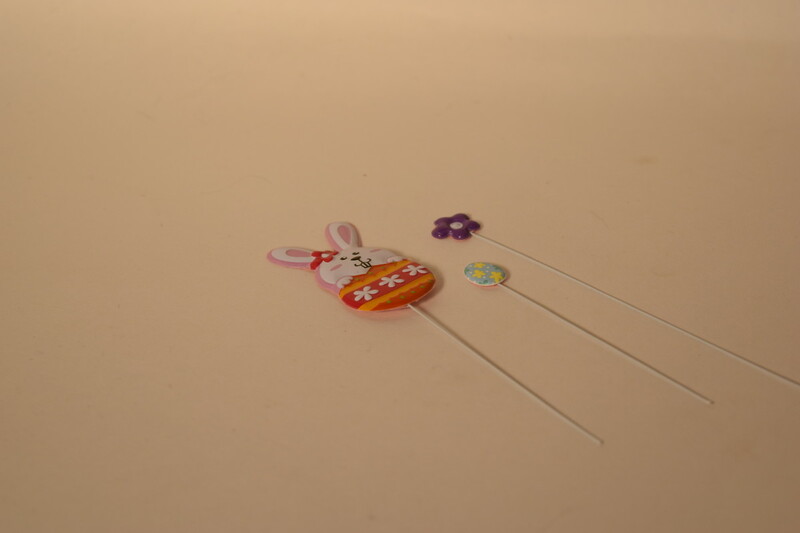 Take the flowers, leaves and the stickers on sticks and arrange them decoratively in your hand. When you are satisfied with how they look, cut the wires to length with the bottoms of the stems you have chosen. Cut about 4 inches of florist tape off the roll and wrap it snugly around all of the wires and stems so they are somewhat secure. Don't worry if some things twist around. You can fix that later. Take your safety pin or brooch pin and position it on the back of the stems. Open it so it is easier to wrap the tape around its backing. Cut another four inch piece of florist tape and securely wrap the pin to the back of the stems. 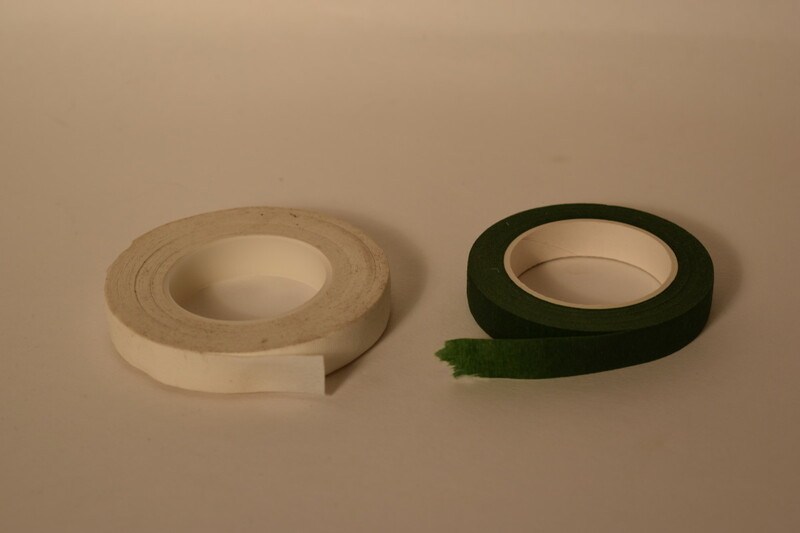 Cut more florist tape as you need it to wrap the stems tightly and securely, leaving enough room on the upper end to re-position the flowers and wires. Re-position the flowers and wires by twisting them and bending them until you are satisfied with their position. Look at that gorgeous boutonniere or corsage you just made! 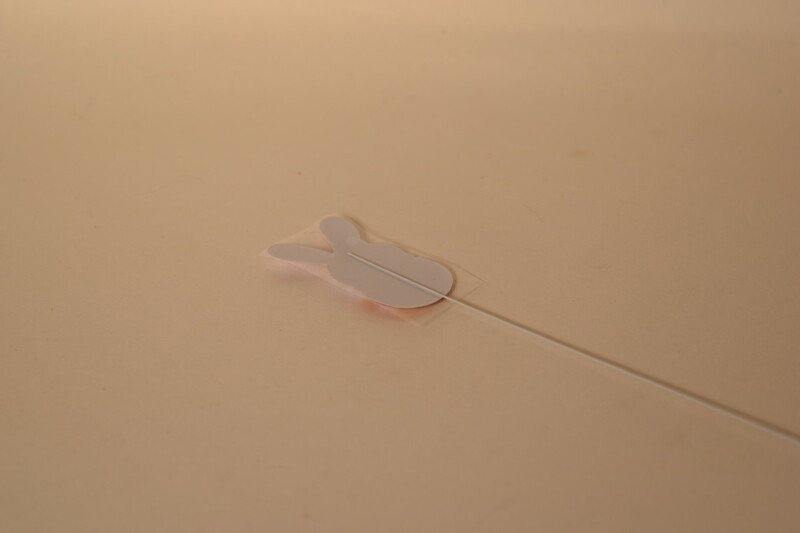 Be sure to adhere the paper backing well to the stickers, making sure the paper is sealed firmly around the wires. Do not trim the wires yet. Cut two or three 4 inch strips of floral tape and set them aside. Take all the flowers and other elements you have chosen for your boutonniere and arrange them in your hand like you are putting together a bouquet. 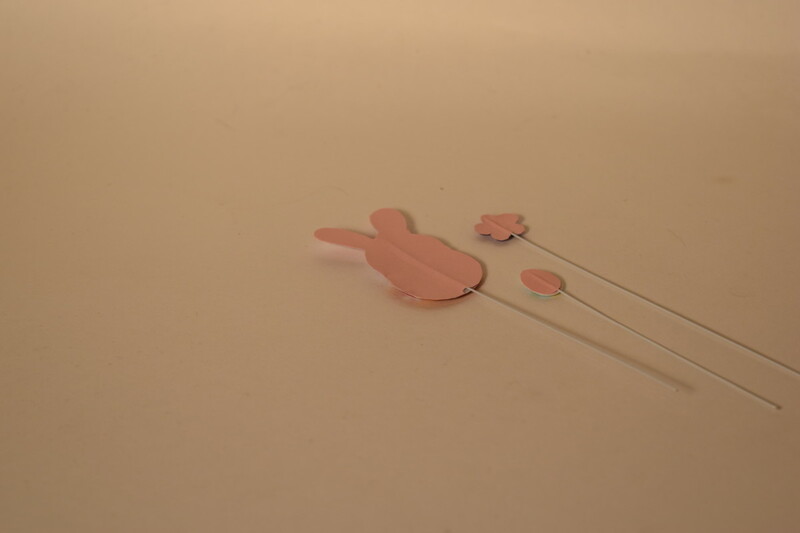 When you are satisfied with your arrangement, cut the wires on the stickers to the length of the longest stems. Take a piece of floral tape and wrap it snugly around the stems and wires to secure and hold everything together. Don't be too concerned if something turns sideways or is all bunched together. It will all be rearranged in the final stages. Place the safety pin or brooch pin on the back of the stems. Open the pin so it is easier to secure it to the stems. Take another strip of florist tape and securely wrap everything so that all of the lower stems are covered and the pin is firmly in place. Use as much tape as you need to make sure nothing can fall apart. Look at This Really Cute Boutonniere! 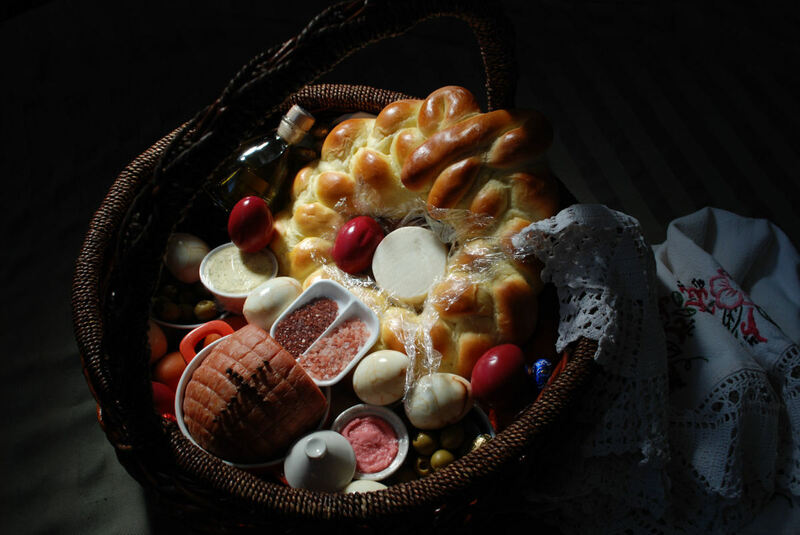 Do you have traditions that you honor during holidays you celebrate? 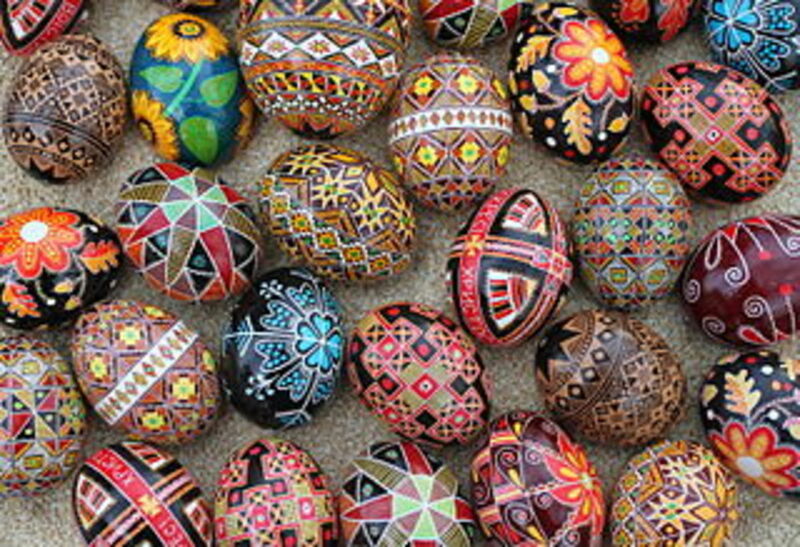 No, I don't have any particular traditions. 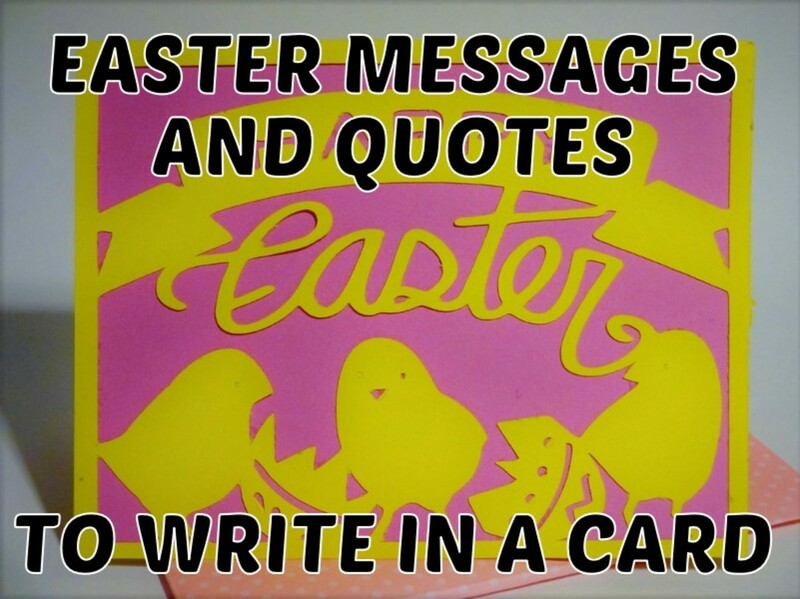 Now Is the Time to Add a New Easter Tradition! 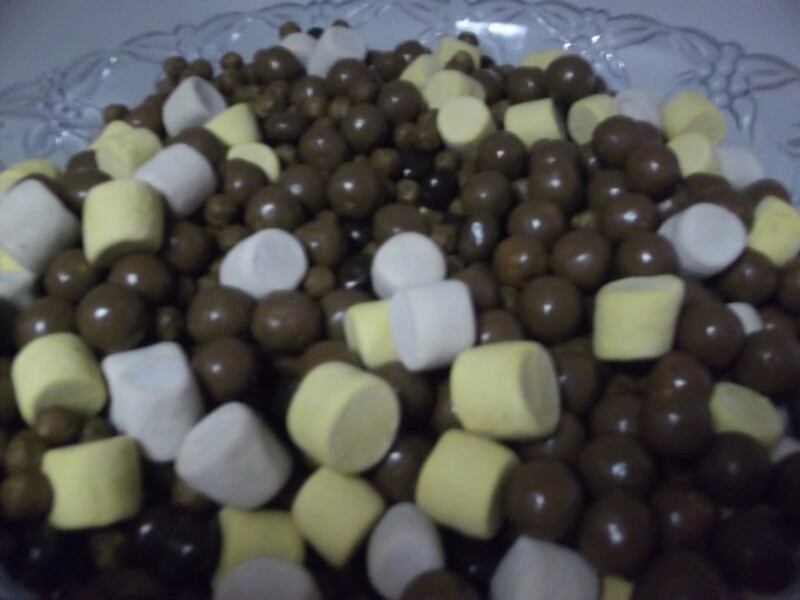 Take the time to make these together as a family or even just for yourself. 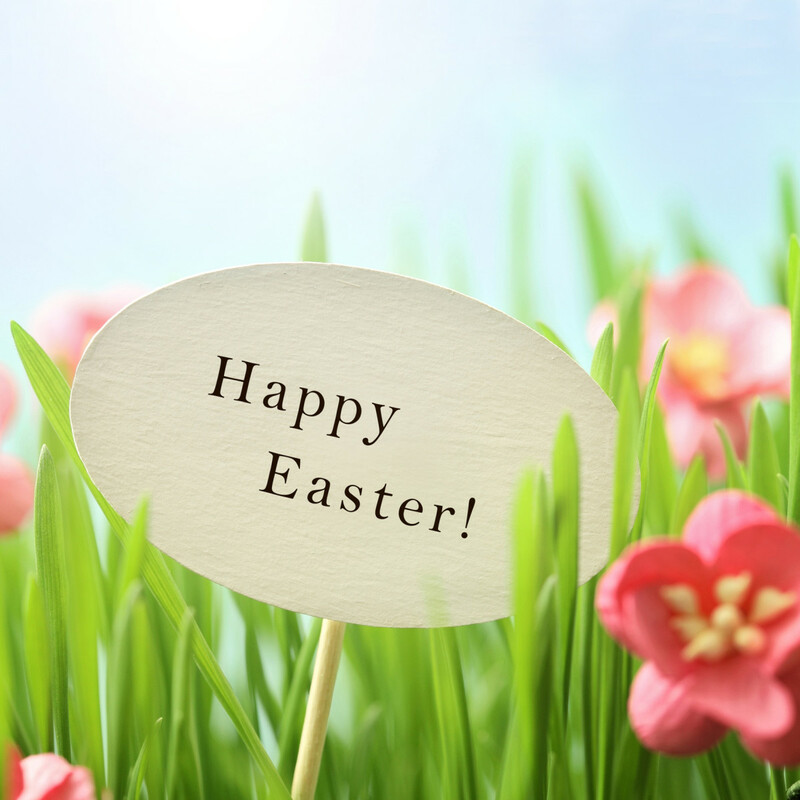 It will give you little giggles as your Easter bunny be-bops along with you during this holiday!